Today I'm sharing three easy recipes for entertaining. I love having healthy, crowd-pleasing recipes that I can throw together quickly without having to follow too many complicated steps. 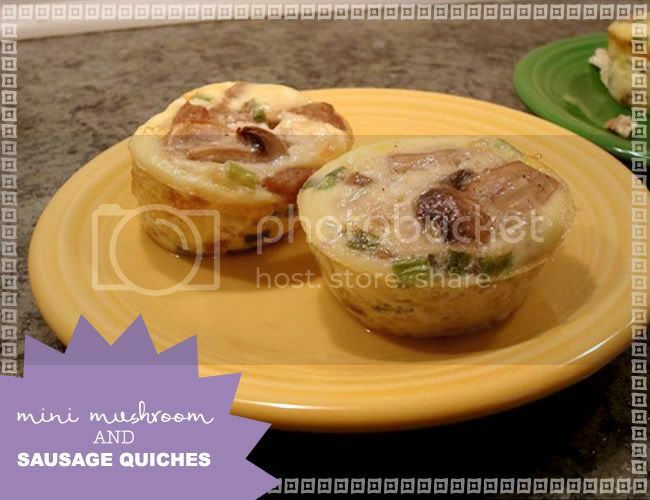 Mini Mushroom and Sausage Quiches are a breakfast fave and you can easily add new fillings to mix them up. Preheat to 325 degrees. Coat a nonstick muffin tin with cooking spray. Cook sausage in a skillet. Transfer to a bowl to cool. Add oil to the pan and add mushrooms, cook until golden brown, 5 to 7 minutes. Transfer mushrooms to the bowl with the sausage. Let cool for 5 minutes. Stir in green onions, cheese, and pepper. Whisk eggs, egg whites, and milk in a separate bowl. Sprinkle a heaping spoonful of the sausage mixture into each muffin cup. Divide the egg mixture evenly among the muffin cups. Bake until the tops are just beginning to brown, 25 minutes. Serve with fresh fruit. For lunch, my husband always requests my Manly Chicken Salad (although it's a hit with the ladies too!) when we have friends over or we are headed to a picnic. Stir sour cream, mayonnaise, tarragon, salt, and pepper in a large bowl. Add celery, grapes, chicken, and walnuts; stir to coat. Refrigerate until chilled, at least 1 hour. Serve with toast, crackers, or on a nice green salad. I love to serve lasagna for dinner as it satisfies nearly everybody. These Spinach Lasagna Rolls are a fabulous alternative as they take a fraction of the time and work well for vegetarians. Preheat oven to 350 degrees. Boil 6 lasagna noodles until al dente. While your noodles are on the stove top, mix together spinach, cheese, eggs, salt, and pepper. Spread the spinach mix onto a lasagna noodle, and roll it up and place in a baking dish, seam side down. Pour marinara sauce on top of your roll-ups. Sprinkle with Parmesan cheese and cook for 30-35 minutes. Serve with a green salad and crusty bread. 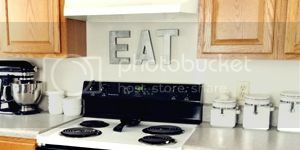 Happy eating and entertaining this summer! I'd love to say hi, so feel free to stop by my little blog anytime. Thanks again, Jessica, for having me! All of these look so good. Esp. the lasagna. I'm pretty sure I'll be making these at some point in the future. Great Choice for a Guest Post. Sam's recipes are wihout doubt healthy but she also adds the je-ne-sais-quoi that transforme the preparation in an easy and fun ritual. I wanted to have the chicken salad - sans nuts for the girly version ahahah - but I'm helpless with Sam's Pasta Dishes. i want to try the mini quiches and chicken salad . . . go sam! I'm going to have to bookmark this page...these are all of my favorite things! Those lasagna rolls are so creative! OH my gosh. So yummy!! Love Sam! That chicken salad looks amazing. Yummmm! samantha is amazing....im seriously amazed at how many yummy recipes she can come up with!